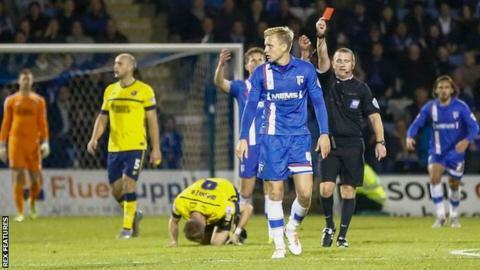 Gillingham midfielder Josh Wright will be suspended for three games after the Football Association upheld his ban. The 25-year-old was shown a straight red card for a challenge on Paddy Madden during Tuesday's 2-1 win over Scunthorpe United. The League One leaders appealed against the suspension but were unsuccessful. Wright will now miss league matches against Southend and Walsall, along with Gillingham's FA Cup first round tie on the weekend of 7/8 November.